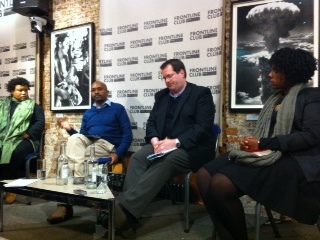 Panelists debate the implications of Kenya’s recent election results. The evening began with a stern warning from panelist Mathias Muindi, currently editor with the BBC Monitoring office in Nairobi. Natznet Tesfay head of Africa Forecasting at Exclusive Analysis Ltd, expanded on this point, arguing that the reaction of the judiciary would be pivotal. The panel agreed that beneath the legalities of the recent election lay more fundamental problems with serious implications for Kenya’s future. The evening concluded with a question from the audience about whether there was space for hope in Kenya’s future. Branch cited the importance of the fundamental, and growing, problem of inequality in the country’s future. Muindi and Tesfay took a more positive line, with the latter citing the growth of internet penetration, a youthful population and a synergy coming from the ground up as serious basis for optimism.